I designed this new limited edition tee just for July 4th! The most celebrated of American holidays is upon us and what could be more American than hot dogs, Old Glory and bald eagles? How about when you combine Old Glory, purple mountains majesties, a bald eagle and astronaut extraordinaire BUZZ ALDRIN!? 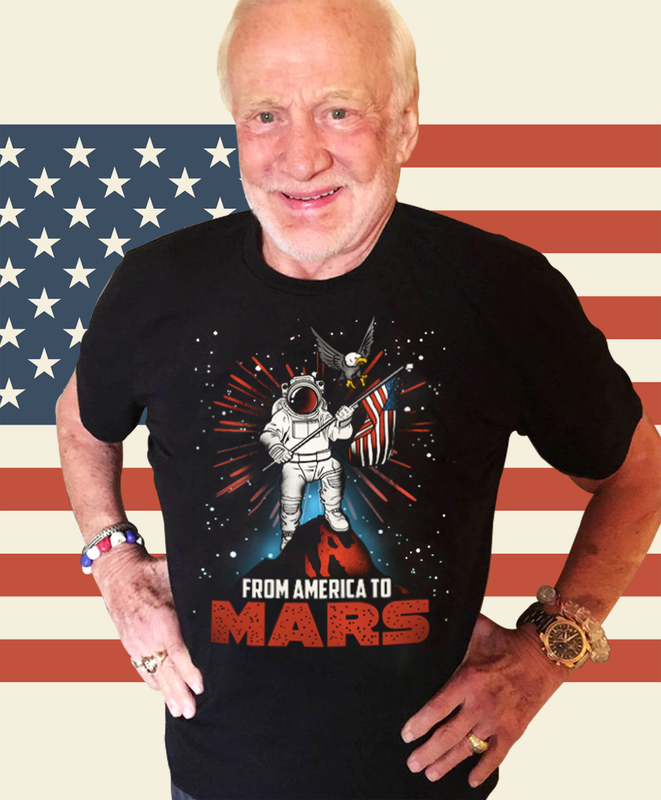 “From America to Mars”, is the fourth shirt from Apollo 11's Buzz Aldrin who is continuing his quest to inspire the human exploration and travel to Mars. 100% of the proceeds raised from the sale of this campaign will benefit the Buzz Aldrin Space Institute. The Buzz Aldrin Space Institute promotes the settlement of Mars through research. International Shipping is available for Moon Landing fans everywhere. Additional Styles and sizes are available in the drop down.